With the performing arts taking center stage at this time of the year, people may forget that there is a great deal to see and enjoy at San Antonio galleries. Here are three outstanding examples. San Antonio Art League & Museum is currently presenting its 2018 Member Invitational Exhibition featuring artists Sylvia Benitez and Vikki Fields, who were close contenders for the 2018 Artist of the Year title, which ultimately went to Steven G. Smith. As dictated by SAALM tradition, the top two contenders’ show follows the Artist of the Year exhibit each fall. Fields, on the other hand, is a Texas native who loves Texas landscapes, especially, the Franklin Mountains, and specializes in working from life in the plein air tradition. “I hope I carry the light and space of South and West Texas into my painting,” she said in a statement. She has the same “from life” approach when working on still-lifes and portraits. 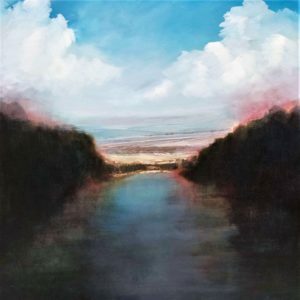 Her paintings have been exhibited both in San Antonio and the Southwest region, with shows at the Coppini Academy of Fine Arts, the University of the Incarnate Word, Texas State University, Blue Star Contemporary and others. Her work is also part of many private and institutional collections. 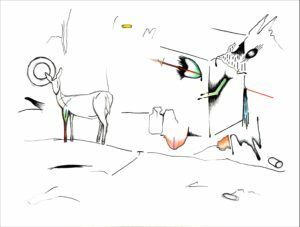 A few miles away, at Ruiz-Healy Art (201 E. Olmos Drive, 78212) there is an interesting exhibit of prominent contemporary artist Hills Snyder’s drawings based on his recent travels through a number of U.S. states. Titled “Altered States, Part Four,” the presented work is the fourth installment of an ongoing project that involves both written essays and artwork. While the former are published by the online art magazine Glasstire, the color-pencil drawings have been shown at different galleries. At Ruiz-Healy Art, you will see 120 drawings based on photographs the artist took while exploring the byways of Oklahoma, Colorado, Wyoming, Montana, Utah, Texas, and a few others. “I’ve visited out of the way places in the country, randomly running across found beauties, overlooked events, discarded things, back roads – anything happening outside the frame of relevance and other assumptions of importance,” he said in a statement. According to gallerist Patricia Ruiz-Healy, the result is “brilliant.” “I see the drawings as a reflection on the state of America today,” she said. The work of several of Snyder’s artist friends will be shown in the offices, including pieces by Jesse Amado, Leigh Anne Lester, Ethel Shipton, Nate Cassie and the late Chuck Ramirez. A reception and artist talk are scheduled for Jan. 12 at 1 p.m. The exhibit closes on Jan 19, 2019. A short trip past 1604 on the North Side will take you to the Musical Bridges Around the World Gallery (23075 IH-10 Frontage Rd., suite 101) which has been very active for the past few years. The current show features new works by the Spanish-born artist Fabian Lainez, who now resides in San Antonio. 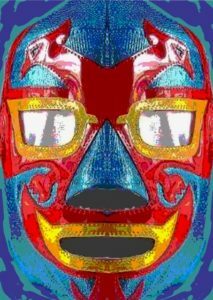 Titled “Luchadores,” the exhibit draws a parallel between hard-working, successful Mexican immigrants and the Mexican wrestlers known as luchadores who traditionally wear colorful, expressive masks while they fight. “The artist sees the workers as luchadores, fighters,” said gallery director Julia Jara, herself an accomplished art photographer. The show features four digital-print masks and large-scale paintings of actual San Antonians, some of whom attended the show’s opening. “The masks are beautiful to look at in their own right,” noted Jara. She also pointed out that the body of work presented was created especially for the MBAW Gallery, a rather unique situation, and having portraits of real people makes the exhibit unusual as well. It will close by the end of the year.